LOS ANGELES (CNS) — As reaction swirled around President Donald Trump’s June 1 decision to withdraw the country from the Paris climate accord, Los Angeles received a report on “the dramatic increase in the numbers of our brothers and sisters who are homeless,” said Archbishop Jose H. Gomez. 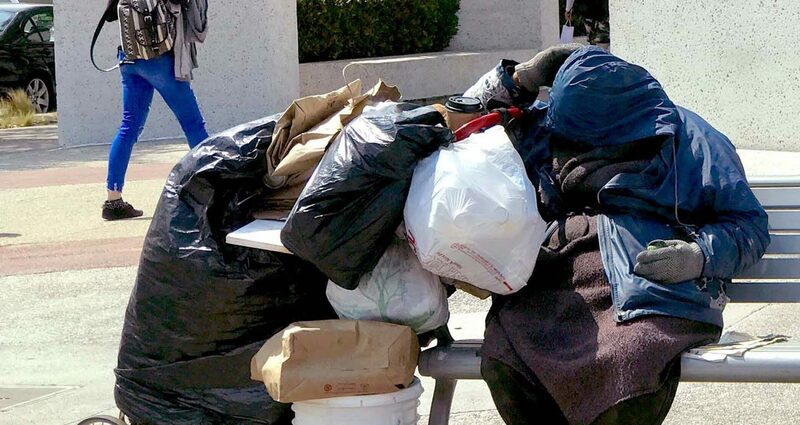 “Each night in the county of Los Angeles — nearly 58,000 people have no place to call home,” the archbishop wrote June 6 in Angelus, the online news site of the Los Angeles Archdiocese. “Human life and human nature must be protected and cared for — our rights and dignity, the needs of our bodies, minds and spirit,” the archbishop said. He added: “Many authorities believe the world is already well on its way toward the goal of a global economy that will be far less dependent on carbon-generating energy sources.” Others point to progress in the areas of “green” jobs and the already-declining costs of renewable energy sources, he added. “The natural environment must also be protected and cared for. We are not put here to consume what we need and throw away what we do not, with no regard for the health of our communities or the needs of future generations,” he said. Like the debates over how to address climate change, opinions differ on the causes of homelessness and how best to respond, Archbishop Gomez said. Both issues require “prayer and thoughtful action,” he emphasized. “Human life and human nature must be protected and cared for — our rights and dignity, the needs of our bodies, minds and spirit,” Archbishop Gomez said.